Halls Creek has a very strong Aboriginal, pastoral and gold history. James Darcy - Royal Flying Doctor Service Established. 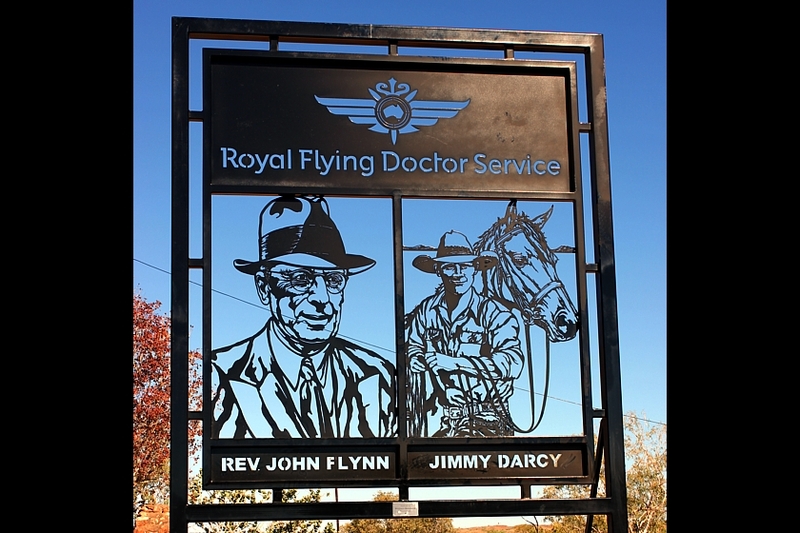 29th July 1917, the accident of stockman Jim Darcy causes a chain of events that eventually leads to the founding of the Flying Doctor Service in Australia. Much of the Australian outback is characterised by extreme isolation. In the early 1900s, the population density of the outback was less than one person per square kilometre, and essential services beyond urbanised areas were few and far between. James Darcy, more commonly known as Jim, was a stockman at Ruby Plains, a pastoral and cattle station about 50 km south of Halls Creek in the East Kimberley region of Western Australia. On 29 July 1917, Darcy was mustering stock when his horse stumbled in a hole, throwing the stockman to the ground before rolling over him and pinning him down. It was several hours before Darcy was discovered by his workmates. He had to be ferried many kilometres back to Ruby Plains on a flat wagon with no springs to cushion him during the bumpy ride. No one was qualified to give him the necessary treatment there, so he faced an agonising twelve-hour ride to Halls Creek. There was neither doctor nor hospital in the township, but the postmaster, Fred Tuckett, had limited medical knowledge. He administered morphine for Darcy’s pain, and recognised the young man was suffering internal injuries. In search of a doctor, Tuckett telegraphed both Wyndham and Derby, but the doctors from both settlements were out of town. He then telegraphed his former first-aid instructor in Perth, Dr Joe Holland, who diagnosed Darcy as having a ruptured bladder. Holland advised the postmaster that Darcy needed to be operated on immediately. Following instructions by telegraph, Tuckett operated on Darcy, using just a pocket-knife and razor. Dr Holland checked in on Darcy's progress when he could. The young stockman seemed to be healing at first, but when complications set in, it was apparent that the doctor needed to attend. On 9 August, Holland found passage on the only ship travelling to Derby, the cattle boat SS Moira, which was not licensed to carry passengers. At Derby, Holland continued overland by Model T Ford until he had to change to a horse and sulky. He then walked the remaining distance to Halls Creeks. The journey covered over 3 700 km and took two weeks. When he arrived, a grief-stricken Tuckett informed him that, although the operation had been a success, Darcy had died a day earlier as a result of complications and malarial fever. The case caught the attention of John Flynn, a Presbyterian minister who had become aware of the need for better medical facilities for people who lived far from major settlements. 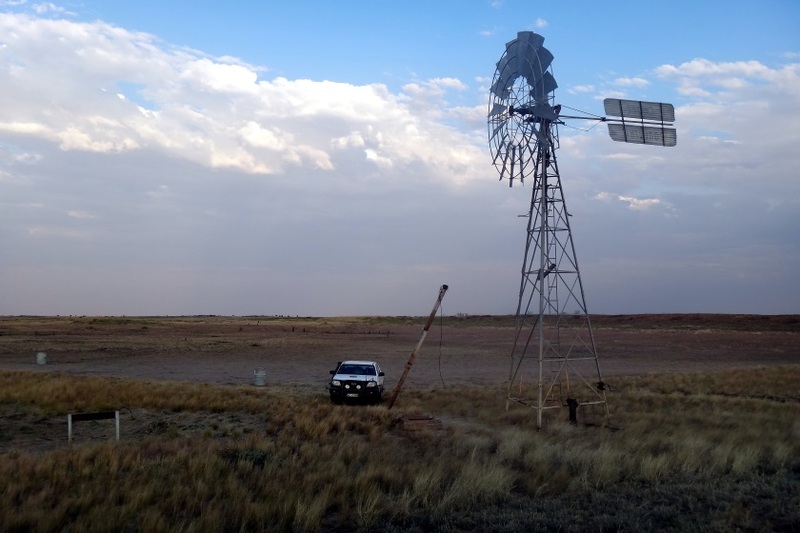 Although Flynn had established numerous bush hospitals in the Australian outback, he had an even greater vision: that of a medical service utilising the emerging technology of radio and aircraft to bring assistance to people in remote areas. Thanks to assistance from various benefactors and other visionaries, in May 1928 Flynn’s vision was realised when the Australian Inland Mission Aerial Medical Service was established at Cloncurry, in western Queensland. The service succeeded, and in 1942 was renamed the Flying Doctor Service. Queen Elizabeth II approved the prefix "Royal" in 1955 following her visit to Australia. The Royal Flying Doctor Service, or RFDS, is still an integral part of Australia today, providing essential medical services to people living in remote areas. Image taken at Old Halls Creek, Pioneer Cemetery. RFDS Memorial. In 1879 Alexander Forrest first explored the Fitzroy River then pushed on in a North-Easterly direction to the Ord River. He reported that gold may be found in the East Kimberley and the land was excellent for grazing cattle. John Adams and Phil Saunders decided to test the rumour about the gold in the Kimberley and dollied a few ounces but did not find payable gold. In 1883 the government sent the second Forrest expedition into the Kimberley and on this occasion the party included Mr Hardman a geologist. Hardman marked his map with several places that gold was likely to be found. Acting on this information, Charles Hall and Jack was likely set sail in a skiff from Roebourne to Derby in early 1885. They travelled along the Fitzroy River, where they found the tracks of the Forrest party and followed the Elvire River. 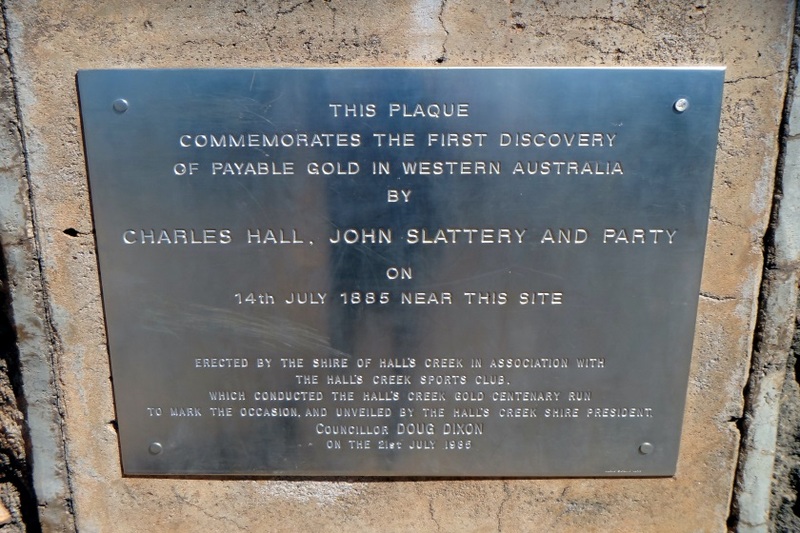 Hall and Slattery found the first gold in 1885 in Halls Creek. Gold was found at dead Finish Creek to the north, 12 miles to Brockman in the west and Mount Dockrell 70 miles to the south-west. Halls party struck payable gold almost from the start. After working for a few week Halls returned to Derby with 200 ounces of gold and reported his find, the first in Western Australia. Between 1885-1887 some 10,000 men landed in the Kimberley with the intention of finding gold but the conditions in Halls Creek were extremely rough with only a few finding golds of any quantity. Five thousand arrived at Wyndham and there was an endless procession from Queensland. Nobody knows how many died just getting to Halls Creek, crossing the water less desert and crocodile infested waters - many simply turned back. When some of the men actually arrived at Halls Creek, dysentery, scurvy, sun- stroke and simple thirst took its toll. In the early days of the gold rush no records or statics were recorded for either the arrivals or deaths. The Government had applied a gold tax of two shillings and sixpence an ounce. It was a very unpopular levy with the miners where gold was so hard to find in Kimberley, the diggers avoided registering and the Government had a great deal of trouble collecting the tax or statistics of any kind. Halls Creek was now a real shanty town of wood, stone, canvas, tin, bark and spinifex. Among the humpies were two hotels, a post office and a gold warden. A lot of gold went out of the Kimberley via the Northern territory and it was rumoured that a gold buyer was to have taken 3,000 ounces of gold at a time out of Halls Creek. It is estimated that as much as 23,000 ounces (nearly 650 kg) of gold was taken from the fields around Halls Creek, some unofficial estimates were as 100,000 ounces. After the 1885 - 1887 influx many went away leaving the diggings and when gold was found at Nullagine more miners left for this new find. The gold rush lasted only a few years as machinery was too costly to transport and the gold finds, although good, was not enough to cover expenses. The rush started in Coolgardie so most prospectors moved on leaving only the mine shafts and many unmarked graves. In 1955 Halls Creek town site was relocated 15 kilometres to the west for easier and quicker access to the airport and on less rugged terrain so that expansion of town could take place. One mine the Ruby Queen Mine kept operating until 1954 and even today the battery is still standing. The mine is in a state of collapse but work is carried out on the creeks around the shaft. Traversing the Gibson and Great Sandy Deserts, the Canning Stock Route is known for being the longest stock route in the world and the most challenging 4WD journey in Australia. Stretching 2,013 kilometres (including side trips), the Canning Stock Route links Halls Creek and Wiluna and is an adventurer's delight as it takes you across a spectacular yet isolated landscape that is rich in pioneering history. The route was surveyed by Albert Canning in 1906 and 1907, to later develop the route between 1908 and 1910. A total of 51 wells were constructed along the 1,850 kilometre route, marking a day's travel between each point. By 1929 a reconstruction team was contracted to make repairs to broken down wells and equipment, however this was not completed and the route was subsequently claimed inapt for its original purpose. During World War 2, the Stock Route was reconstructed and repaired, awaiting an expected attack on the northern areas of Western Australia. Today, the route is frequented by 4Wd enthusiasts travelling for the ultimate outback experience rather than the excitement of reaching the destination. Jack Jugarie has left behind a legacy to the people of Halls Creek, the Kimberley and Australia. As a Djaru elder, Jugarie held respect from the whole community. His life story can be referenced as an act of pride, determination, knowledge and sheer commitment to his people. From night patrols with the Alcohol Centre, to working on canvas by day at the Yarliyil Art Centre, Jack Jugarie had become an international celebrity. Though his artwork was inspiring, Jack was elevated into the international arena through his presence in the ABC documentary, "The Human Race". The documentary captured three men from diverse backgrounds tracking the harsh desert unaided by foot more than 350 km from Wolfe Creek Crater to Wyndham. Carrying only a swag and a litre of water, Jugarie who was more than 70 years old, used the stars to navigate his way and the spiritually of his native land to help him find food and water. The other competitors were, Ruby a sixty-one-year-old German, whose survival knowledge came from South American tribes, and Dave a thirty-year-old American Ultra marathon athlete. "Mate I wasn't born in the city, I'll beat you any day... I'll walk till sunset and then I'll drop my swag," Jack had said to the other competitors before the race. In true mate ship, Jugarie had also shared some handy tips on where and how to find bush food and water, with the other competitors. Grog making people lazy, me I can still do a hard day’s work without getting slack... I bin (have) proved myself lunga (at) that race with that young one American and that other one from Germany, Ruby." Jack had stated. During the race the competitors encountered crocodiles, dry creek bed, harsh terrain, exhaustive humidity and aching muscles and blisters. But this adventure documentary was not the sole reason what Jugarie had become a local legend. Prior to the launch of 'The Human Race' in 1996, Jugarie had already made his mark on the East Kimberley community. Born into Halls Creek Pioneering history, Jugarie was instrumental in the insuring that Aboriginal people were represented in the town. He was Halls Creek's first Aboriginal Police Aide, he was also a Bush Tracker, and an orderly at Fitzroy Crossing's Hospital. He worked for the Shire as a Road Worker and Grave Digger, back when it was called the Road Protection Board. Jugarie also guided geologists from the Bureau of Mineral Resources around the East Kimberley before roads were constructed in this region. This was prior to 1964 when Aboriginal people were still classified as Flora and Fauna and were excluded from State Federal voting rights. Jugarie's birth certificate states he was born on the 1st July. He shared his birthday with many Aboriginal people allocated this birth date if they were born before the 1960's. Jugarie's story has featured in many newspaper and magazines. These included The West Australian, The Sunday Times, The Outback magazine, The Bulletin, In-flight magazines on QANTAS and Ansett as well as The Australian - to name a few. The Shire of Halls Creek wanted to build a statue in remembrance of Jugarie. 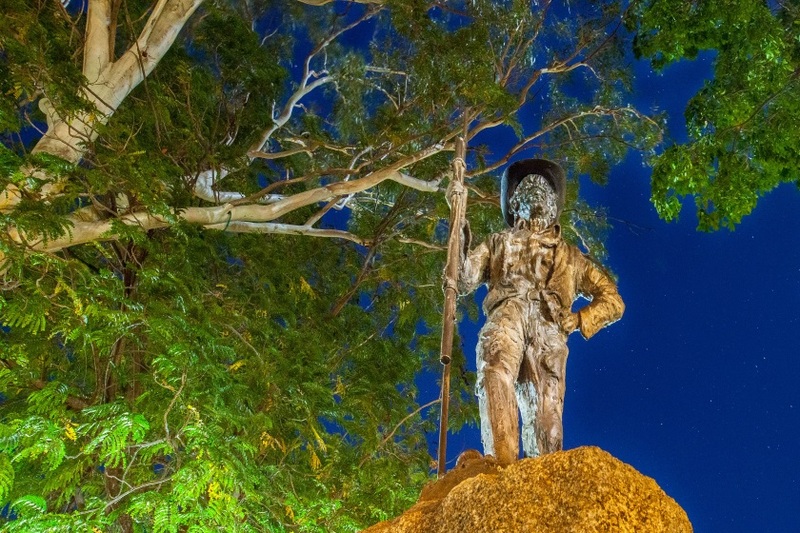 Halls Creek already has a statue of 'Russian Jack' - depicting the spirit of Pioneering Heroes. It is only fair that an Aboriginal Hero resonate the same honour. Prior to his death Jugarie had been consulted on whether he would like to be captured in the form of a statue, and he had said: "He right, big mob of people know me. He good for them to see us mob (black fellas) standing proud." A statue was erected in the Town Park of Halls Creek in June 2001 in recognition of this man's amazing life. The unveiling was held in conjunction with the official opening of the Community Resource Centre. He was born in 1927 on Bow Desert Station, just past Ruby Plains. This place was owned by George Tremouth. The month and date are unknown. His dad was first cousin to Rosie Skeen also Polly Thomas and many others. But aunty Polly was the one who reared him up from when he was three years old, to his teenage stage. Then he was old enough to work, he came out to Sophie Downs Station to his aunty Rosie Skeen. Him and my brother Bob worked together and were around the same age. From there he found himself a wife named Daisy and they went on a droving trip with one of our relations again, Jack McCale. They spent couple of years droving, then they both went to Moola Bulla Station and worked there. Somewhere along the track he parted from his wife, then him and Connie got together and had a family. When he came back from Moola Bulla and they had children now and he got a job as a Police Aide, here in town and that was back when town first started here. He was never out of work. He was always willing to take on a job and he was a good worker. His dad was like him, but his dad went to prison. Really, his father should not have been punished, it wasn't his fault. His master George Tremouth told him to go out and get some meat for the station on a pack horse. When he done that and was going back home with a load of meat and also a rifle. The Halls Creek Police came and questioned him and took the rifle off him. The police took him back to the station and asked master Tremouth if he had received permission to go out and use his rifle. I believe George said NO and he lied and said he didn't give him permission. And that is how his dad got into trouble and that is how he ended up in Fremantle Prison. So, he must have only been three or four years old. He would hang onto his father from Bow Desert to Halls Creek, so the whole family had to come into town. Then one morning his father and the other men went to get some wood, back when we had wood stoves. He cried and cried to follow his dad he always wanted to be near his father, but they told his mother to get hold of him, because they were only going out to get some wood. That was the last time he saw his dad and I believe the other men returned with no wood. This happened in 1930 the year my brother Frank Skeen was born in June. Better known as Russian Jack, he was a Kimberley prospector and a good mate who wheeled his sick friend 300 miles through The Kimberley's harsh landscape to Halls Creek for medical help. A SHORT BUT SIGNIFICANT LIFE! 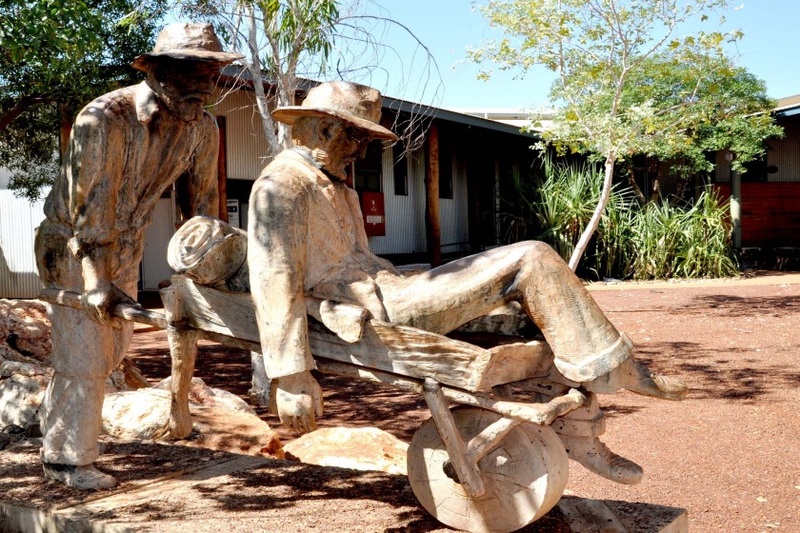 The statue cost the Halls Creek Shire $20,572.00 and is currently insured for $60 000 C.P Somers constructed the statue in 1979 and is currently located the Visitors Centre. The plague to Russian Jack was unveiled by the Hon. K.A. Ridge - Minister for housing and M.L.A. for Kimberley on 11th August 1979. Originator - C.L. McBeth/Sculptor - C.P. Somers/Bronze Casting - P.C. & Timms & Co P/L. While doing some research for a trip later this year to Russia, local historian and writer Bryan Clark stumbled onto a fascinating story. That story concerns a pioneer of the West Australian outback and goldfields, known to his peers as Russian Jack. Bryan now hopes to use the information he has found to restore the memory of an amazing man and take the story with him to Russia and Jack's hometown. "How it all happened is a bit of a long story" explained Bryan. I have been invited by the Education Department and local Government authority in Russia to do a lecture tour in August and September. In my negotiations with the organizers of the tour we have established that they want me to speak on Australian journalism, advertising, Aboriginal Culture and commercial publishing. Those things might seem ordinary to us, but the Russians who have just come out from behind the curtain they are extraordinary - those people are hungry for knowledge. Anyway, during my preparations I decided that as well as those subjects I’d like to take them some information about some kind of link between Western Australia and Russia and believe me there are not many. It was while I was doing that search that I bumped into Russian Jack or his ghost a significant part in the development of the goldfields. He was a fascinating man and is still the stuff of legends in some of the northern inland mining towns. "However, i discovered a couple of disturbing things during my research," said Bryan. One was that no one in Russia knows of him. The second was the alarming fact that this great man was buried in a pauper grave in Fremantle. This in itself is ironic when you consider that he is honoured in a $15,000 sculpture in Halls Creek. His findings prompted Bryan to take action. He has already committed himself to trace the man’s origins during his six weeks in Russia and also hopes to take with him blown up portrait of Russian Jack with an inscription from the people of Western Australia to present to the people of Archangel. Bryan's most important mission though is to raise enough money for a memorial and commemorative plaque for Russian Jack. he has already written to the Northwest Shire which have an historical connection with Russian Jack and is currently in the process of self-publishing a biography of the man including photographs and artwork. The booklet will be completely produced in Carnarvon and sold through tourist bureaus with the proceeds going into a memorial fund, which already holds $550 in private donations. Bryan Clark, this week continues the amazing life and adventures of the famous Russian-born goldfields pioneer Russian Jack. In 1928 the eccentric journalist, Mrs. Daisy Bates, recalled Russian Jack in a newspaper report, stating that he came from " some Russian seaport in the late 1880's. I tell his story in hopes that it may give some people kinder ideas of some Russians. He was a tall, hefty man, with a voice like a Bull of Bashan, and he knew only a dozen words of English when he first arrived in WA. Following the lure of gold, he found his way northward to the Kimberley district with an Australian mate. No one knew Russian Jack by any other name. He and his mate worked around the Derby area, paying their way and keeping their and up. And whatever distance they might be from Derby or Broome township Jack trolled his wheelbarrow in for supplies, leaving his less hefty mate at the gold workings. One day, when Jack had returned with a barrow load of fresh supplies, he found his mate down with fever. Tender as he was huge, Jack nursed his mate with the devotion of a true friend. When, with no avail, he had tried on him all the patent medicines at the camp, he said in his big voice: I'll take you to Broome to see a doctor. His mate protested, but Jack did not argue. He made his wheelbarrow into a sort of ambulance, fixed a place to hold some rations and a gun, put his mate to rest on the improvised bed, and started to wheel him nearly 150 miles (240 kms). Over rough and smooth country, by dry creek beds and river crossing haunted by alligators (she meant crocodile), Jack trundled his sick mate, resting when his patient was fatigued, cheerily nursing and feeding him and brought him triumphantly to Broome and saved his life. In 1970's, Mrs Bates noted while travelling to the Murchison area, that she actually met the big Russian. She wrote about 25 miles (40 kms) from the Peak Hill Goldfields we had stopped our buggy to wait and rest when out from the bush camp stepped a big burly man with a huge melon in his hands, and from his mouth boomed the words: Melon very good lady. You like rest and eat? In a moment I thought of Russian Jack and sure enough, it was he. But no answer would he give to my question about his work for the love of his mate, all I could persuade him to say was: That was a long time ago. That was nothing. His mate had married and settled down and Jack was cultivating vegetable garden for the Peak Hills Goldfields and was in charge of the coach horses plying between the gold area and the coast. Still he kept his good name with everybody and helped many a down-and-outer. In honesty, in signaled of purpose, in the clean simplicity of his life and religion, this Russian Jack was a great man in his ideal of the real friendship that means so much when men are thrown together far back in a continental interior like Australia. It was this magnificent effort that prompted the residents of Halls Creek to erect a posthumous statue to commemorate the super-human effort of the gracious Russian immigrant. Another recorded incident concerns Russian Jack and a mate returning from an unsuccessful prospecting venture inland when their food supply ran dangerously low and they decided to shoot a Kangaroo to help feed them along the track. Jack's mate spotted a kangaroo and decided to chase it on foot. Unfortunately, he tripped and broke a leg. In typical fashion, Jack lifted his injured mate onto his wheelbarrow and pushed him to safety. When the pair eventually arrived in town, one of the locals mentioned that Jack must have travelled over a certain rough track, one noted for its potholes, stones and gullies. Jack told the admiring on-lookers I pushed him over 100 miles (160 kms) in that damn wheelbarrow. The man with the broken leg, from Russian Jacks wheelbarrow remarked dryly: Yes, and I'll answer so far, he hasn’t missed a rock. While working at a Mount Morgan gold mine, Jack fell down and jagged open cut excavation while strolling through the bush in the darkness. Three days later other prospectors found him he was 21.4m below the ground surface cut and fly blown and his only comment was to his rescuers: I've missed a shift. At the gold town of Coolgardie is believed to be preserved the wheelbarrow, which in the late 1800'd Russian Jack pushed from Southern Cross to Coolgardie, traversing over 185 kms of trackless, arid desert country in search for gold. The wheelbarrow had shafts 2.1m in length and the timber utilised was casing that had been used to transport galvanized iron. The large wooden wheel may have been useful in crossing the sandy patches, but its friction on the axle must have been quite severe, requiring extraordinary strength to negotiate over the hazardous landscape. A prospector observed: Most men, many of whom pushed wheelbarrows themselves, could not move this one. It had a wheel in the middle instead of in the front and its shafts were seven feet long. The barrow is said to have been loaded high with heavy tools, blankets, a water cask and supplies for several months. Russian Jack came into town for provisions on one occasion during a prospecting stint. As was his habit, he also stopped at the hotel for one beer too many. When he arrived for Jack to return to his prospecting site about 12km out of town, he hastily threw on to his great wheelbarrow all his groceries, a bag of potatoes, drilling gear and explosives. His dynamite was secured in a wooden box, but a tin of 50 firing caps-extremely sensitive objects-were casually thrown on top of the unwieldy load. Jack tied nothing down. Everything on the wheelbarrow was carelessly arranged. With the slightest mishap, the firing caps could easily explode, causing severe damage or worse nonplussed, Jack did not care, he was happily drunk. Some observers on the main street watched as Russian Jack effortlessly took up the shafts of his great wheelbarrow and uncertainly tried to push it in the right direction. But being inebriated, he progressed haltingly, weaving all over the road. A policeman observing Jack's erratic steps, remark to a companion: Russian Jack has a load up inside as well as on his barrow and decided to intervene by escorting him safety out of town. Along the way however, the policeman spotted the tin of firing caps balanced precariously on top of the load. Jack informed the constable ha had recently received some money for gold nuggets sent to the bank, and was intent on proceeding to his mine, the firelight, about 12 km away. For his own safety, the lawman decided to arrest Russian Jack, but was uncertain how to do this, as the big Russian was an unusually strong man and had to be handled cautiously at the best of times. Jack continued staggering all over the road, bellowing out a song in his raucous, booming voice. As he drew near the police tents, several policeman intercepted Jack, suggesting quietly that he should repack his barrow. Ever so diplomatically, the police offered the big man a cup of tea as together, they planned their course of action in getting the Russian safely out of town and back to his bush camp. By this time Jack was thirsty again and he agreed to sit down quietly for a spell. As Jack rested he started to doze off. The police repacked his barrow securely while waiting for the Billie to boil. Soon Russian Jack was fast asleep, so the policeman handcuffed the big man to the huge log, their intention being to restrain him until he had sobered and was capable of undertaking a safe journey back to his camp in the bush. Overnight, the policeman was summoned urgently out of town to Cuddingwarra, about 16 km to the west. In his concentration, the policeman completely forgot about Russian Jack being left chained to the huge log near the police tents. Later in the day the policeman suddenly remembered the big drunken Russian he had left behind at Cue, chained to a log. Ridding back quickly, the policeman was stunned to find that Russian Jack was gone. So was the log. The great stump had been bodily uprooted and there were dragging marks on the ground for several metres. It would have taken four men to lift the jail log he reasoned, so perhaps some of the residents had moved the log Jack to a shady place out of the sun. When the policeman conducted a quick search of the town site, at the hotel he discovered Russian Jack sitting quietly at the bar having a conversation with the barman. The log was propped up on the counter and Jack was still chained to it. It was learnt that Jack had awakened, it was daylight, and the merciless sun was beating down on him with a vengeance. Famished for a drink, and not particularly fussy how he obtained it, the big Russian wrenched the tree stump from the ground, balanced it on a shoulder, and walked away in search of refreshment at the nearest pub which was a quarter of a mile away. When the hotel opened its doors, there was Russian Jack, chained to a log, asking for a cool ale to prevent him dying of thirst. I thought I left you in jail, Jack, the policeman said. So, you did, Jack replied, but it was low-down you leave me all night with no drink. Anyway, you have one drink with me now and I’ll go back to jail. With some amazed police offer in tow, Russian Jack again shouldered the jail log and strolled back to the police tents where he resorted the makeshift jail to its original location. At the police camp the officer removed Jack's chain and put a billy on the campfire, which they shared. The policeman said to him, "You had better go back to your show (goldmine), and the next time you want to have a few pots, don't buy explosives at the same time." Later Jack gratefully thanked the policeman for preventing him leaving town with his firing caps unsecured. Jack's physical strength was known to be immense and many were the stories told of his magnificent feats. At one time, when working as a labourer on Doorawarrah Station, he was dismissed by his employer for wrecking equipment. Jack allegedly bent a 4 cm octagonal crowbar over his knees in an angry moment. On another goldfield, at Peak Hill, Russian Jack ran a crude-eating house. With a manure heap nearby, millions of flies were usually added to a meal of damper (crude bush bread) and tea. A Frenchman, Albert Duclos, set up his camp close to Russian Jack's business, hoping to steal some of his customers. As the two were already enemies, Jack took quick action: he chased the Frenchman with a meat chopper, threatening to make him the mincemeat. Duclos escaped from the enraged Russian, but thereafter kept a respectable distance between them. In his grubby eating house, the big man waited on his customers - all of them rough gold diggers - without ever wearing boots and his unwashed trousers rolled up to his knees. He is said to have a hand the size of a leg ham, and he sported an unruly black beard. A passing coach driver once paused outside Jack's premises to offer him a drink from a half full bottle of whiskey. No thanks, said Jack, I’m not drinking now. When the offer was repeated, Jack grudgingly consented to half a sip. He poured half the bottle of whiskey into a mug (metal cup) and swallowed the lot in one swift gulp. When the coach driver saw his empty whiskey bottle, he said, well, if he's not drinking, I’d hate to see him when he was. One time Jack was asked what he would most like to achieve in his life. He said he would like to retire near a city in Western Australia, grow lots of vegetables, then sit down by himself and eat the lot. According to the official burial report, Russian Jack died in a private hospital, Mandurah Road, at Fremantle, Western Australia, on April 17, 1904, aged 40 years, after succumbing to severe pneumonia, following two week's illness, and was buried two days later in a local cemetery in the public section, Grave No. 245. His burial particulars state his parents' names were unknown, with a Roman Catholic minister, John Smythe, officiating at the burial in the Roman Catholic Cemetery, Fremantle and also recorded as unknown is whether John Fredericks was married or had offspring. No headstone marks the site. Why did Russian Jack a man of exceptional physical strength, die so young? Over the distance of time, the observer can only speculate. Most of his 18 years in Australia were spent in tropical or sub-tropical areas, thirsty country where men drank excessively, and Jack was certainly known to have acquired the common addiction. Thirsty diggers often drank till they dropped, usually sleeping off the effects of bush grog under the warm southern skies. Did the big Russian make a fatal error of transferring his casual Northwest lifestyle to the sometimes-chilly skies of Fremantle? His death came as a surprise for on one could imagine death in the prime of life to one of such Herculean strength. He was, so far as physical manhood is concerned, a picture, but he combined the strength of lion with the tenderness of a woman. Though he had a loud sounding sonorous voice that seemed to come out of his boots, there was no more harm in it than the chirp of a bird. Many instances are known of his uniform good nature, but his extraordinary kindness, some years ago to a complete stranger...that he picked up on the track to the Kimberley gold rush exemplified his mate ship. The stranger had a wheelbarrow and some food and the burly Russian picked the stranger up, placed him on his own large wheelbarrow, together with his meager possessions and wheeled him nearly 300 miles (480 km) to a haven of refuge. Following his death there was, and still his aura of mystery surrounding his background. This may have been due to Jack's poor knowledge of the English language, coupled with a semi-literacy and lifestyle that compelled him to live a fairy isolated existence. West Australian author Mary Durack observed in 1977, "Some say he was a short, stocky man, others that he was a giant". Retrospective observers - nearly always contradictory or, at the very least, unreliable - have recorded his height as varying between almost six feet (2.1m) tall. Jack was buried in a public grave, that is a pauper's grave, in section CC, Grave Number 245 at Fremantle, with not even a common headstone to mark the site of one or Western Australia's most colourful pioneers. His death certificate records his profession as 'market gardener' revealing that the big man seemingly fulfilled his life-long ambition to have his own private supply. Following his death in 1904, a Fremantle newspaper obituary said: Russian Jack, if there are Angels in Heaven who record the good done on Earth, thou wouldn’t have sufficient to thy credit.............to wipe out the many faults that common flesh is heir to.